I have disabled "check mime types" in the Media Options (click Options button from Media screen). I have been uploading files through the Media Manager. JPG and PNG work, while PDF does not. I reported this to Rochen, who confirmed that finfo_open and mime_content_type were installed, available, and working correctly. Their response was this: "Well there seems to be compatibility issue with mime_content_type on Joomla version and PHP v7.0, If I switch the PHP version to v5.6 it is working fine. It appears the patch provided isn't working on 3.7.1 and 3.7.2, due to mime_content_type. Thanks!" Previously I was running PHP 7.0.19. Can't confirm, test using PHP 7.0.15 and 7.1.1. I cannot replicate this at all. I also couldn't replicate this issue, pdf uploaded without errors. we're having this issue - "fileinfo.so" php extension was disabled in server. enabled fileinfo php extension and all good. maybe a more informative error message would help debuging issue adding something like "Could not detect the file mime type. Please check with your host if you have fileinfo PHP extension enabled.". anyway with php fileinfo extension enabled cannot replicate the issue. My fileinfo extension is enabled. @zero-24 Since Check MIME Types is disabled, Invalid mime type detected. shouldn't be checked/displayed. Right??? However, a second support person has come back to me after that change was made. He switched PHP 5.6 back to PHP 7.0. The PDF upload now works. He says "I suppose it's possible that a needed PHP extension (like fileinfo) hadn't been selected previously, but the new defaults in the selector resolved the problem." c. See if fileinfo is checked. b. Now switch back to PHP 7.0. Test to see if you can upload PDFs now. My guess is that "fileinfo" is showing as checked when it's not really set. Quy -- yes, that was my expectation for turning off the MIME type check. However, it had no effect on my ability/inability to upload a PDF. Fix (???) is listed in the post before this one. @jen4web My expectation too. The code has to be reworked to first check that Check MIME Types is enabled and not after the fact. @jen4web what error do you get when mime checking is disabled? As this should never be a option you should set. 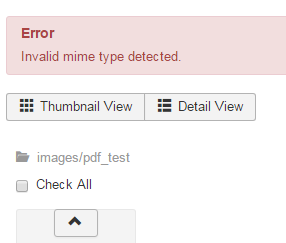 If you try to upload a file on a server where we can not check or detect the mime type we don't allow uploading it. The Check MIME Types check is about checking the actual mime type against the allowed mime type. If no mime type is detected this is not taken into account and upload is blocked. Sure we can improve that message. But this means "We can not detect any mime type for that file so we don't allow uploading it"
Use MIME Magic or Fileinfo to attempt to verify files. Try disabling this if you get invalid mime type errors. getMimeType() should only be executed if Check MIME Types is enabled. The problem is that you do not get "invalid mime type error" (i have already sayed that the message needs to be inproved) you get the "mime type detection is not working on your system" error. Which IMO should be fixed on server side and not just ignored by the CMS. As this is a server / configuration error and not a CMS error ;). We maybe need a suggestion for a better error message in that case. Please take a look here: #16246 for a extended message. I am sorry but I cannot replicate this on our servers (PHP 7.1.14). Sure the most of us can't as it looks like a server / hosting issue. In general, things are working fine as long as the server is correctly configured. The issue we are running into it seems is that there are hosting environments (such as Rochen's) which are disabling features that are by default enabled in the baseline PHP distribution. So, we need to improve our handling a bit; though fileinfo is enabled by default since PHP 5.3.0 (source - https://secure.php.net/manual/en/fileinfo.installation.php), we can't rely on its presence so we need to get a little defensive in our coding. It's not much different than how we had to have some defensive coding around the use of parse_ini_file() and parse_ini_string(). we can't rely on its presence so we need to get a little defensive in our coding. That modal is hardcoded to only display images, even if the upload was successful it will never display PDF files. I get you but why not? If mime-types are supported they should show? I did but I asked a question on that is that wrong? THis is a complete different issue and a long standing one too ;) PLease open a new issue for that. That specific modal and the field it's attached to have always been hardcoded to images only (don't ask why, a decision made long ago is all I know and I had to essentially build a fork of com_media to work with non-image files with a similar user interface). So that view is different than the default media manager view which should show everything in the images directory. As for uploading through JCE, if it's not going through our library class that's running this check, that would explain why you can upload through the editor but not through com_media. JCE is not affected by this because they don't use JHelperMedia's canUpload method. IIRC they use it's own method. If you can view your uploaded PDFs at administrator/index.php?option=com_media (the main media manager view, not the modal window) then the system is working fine. com_media has two main views, the full view which lists everything, and the popup view which is ONLY images. It is a discussion for another issue whether there should be a popup view showing all files, fully separate from this issue thread. Right now though, the fact that you cannot view uploaded PDFs in the popup window is the system design, for reasons already explained. @mbabker I can upload a screencast for you showing that I can upload a pdf both in admin (com_media) and in frontend with JCE? If you say that an upload is not possible we have a bug since I can as shown in the image? I'm not talking about upload at this point, I'm talking about viewing the directory contents, in response to your screenshots saying that PDF files are not being displayed even though they exist on the server. I'm using DreamHost shared hosting, with PHP 7.0.14 and Joomla! 3.7.2. Neither finfo_open nor mime_content_type are enabled by default. After editing a phprc to enable fileinfo as described in DreamHost's knowledgebase, PDF upload succeeds. But attempting to upload mp3 files fail with "Error - Illegal mime type detected: application/octet-stream" or "Error - Illegal mime type detected: audio/mpeg." A simple workaround is to add these types to Legal MIME Types or perhaps set Check MIME Types to No in com_media options. I'm not sure what (if any) security this implicates. This topic on Stack Overflow may help other Joomla users make sense of the seemingly inconsistent errors when uploading mp3s: why some mp3s on mime_content_type return application/octet-stream. How did you got the octet-stream error message? What exact steps do you took? PHP 5.5.3 Joomla 3.7.2 Failing to upload pdfs. All has been well all along but moving to 3.7.1 then updating to 3.7.2 has solved nothing. @lazytocook please get in contact with your hosting and ask about the fileinfo extension to be enabled. @zero-24, thanks will get in touch with my host and get back to you with results. I've experienced this issue on multiple sites on both 3.7.1 and 3.7.2 running both PHP 5.6 and 7. This comment was created with the J!Tracker Application at issues.joomla.org/tracker/joomla-cms/16238. @dstncz have this comment (and following) helped? I have just boarded to my plane. When i'm landed i can prepare you a detection script on what is working or not. Please add this to the top of your template index php file (you can use the backend template editor). And show us the result. Thanks. Says "we use mime magic"
SiteGround support also got back to me. They are adamant that it is a 3rd party extension causing the issue. 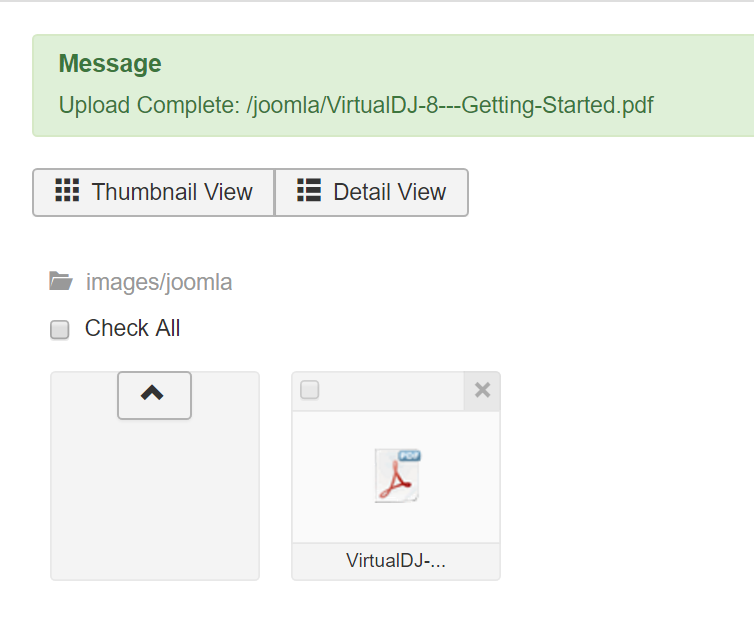 We set up a clean Joomla install on the same container and pdfs upload fine. I'm having a hard time tracking this down. In addition to our site at SG we are also experiencing this issue with 3 additional sites on a separate container hosted at PowerVPS. One of which has barely any extra extensions (3.7.1 with Akeeba Backup, Brute Force Stop, JCE & Rokcandy). I've tried disabling all the mentioned extensions and still get the mime error. Related: I've confirmed that fileinfo is enabled on this container as well with the host. Thought it might possibly be something with CXS, so fully disabled that. Still getting the error. I was able to resolve the issue on both our containers. For the sites running 3.7.1 upgrading to 3.7.2 fixed it. For the SG site, we restored to a backup of 3.7.1 then re-upgraded to 3.7.2. Seems like upgrading from Joomla! 3.7.2 to 3.8.0 has reintroduced the Invalid mime type problem. phpinfo says version 7.0.22 and fileinfo enabled, yet an attempt to upload a PDF via Media Mgr fails with "Illegal or invalid mime type". EDIT: with K2 Media Manager i can upload without any problem! EDIT 2: If i try to upload with JCE File Browser i receive "The server returned an invalid JSON response." I think the problem could be alleviated by changing some of the code in the Media Helper canUpload() method, around lines 270 to 283 in libraries/src/Helper/MediaHelper.php in joomla 3.8. This means that if for some reason the MIME type can't be ascertained, the code checks if the user has Media "core.manage" access before it disallows the upload. So users with sufficient privilege can still do their job, without having to relax the Restrict Uploads setting. (It would also fix this problem). To my mind, this also fixes another inconsistency when the Restrict Uploads is set. When a user who doesn't have "core.manage" access tries to upload a non-image file – even though the file has a legal MIME type, the upload is still rejected because the user doesn't have "core.manage" privilege. Which doesn't in my opinion fit with the description of the Restrict Uploads setting "Restrict uploads for lower than manager users to just images if Fileinfo or MIME magic isn't installed. ", in that it restricts it even if the system can determine the MIME type, and the file passes the legal MIME types check. Login to your Joomla Backend. Go to The System Menu and select Global Configuration. Under the component menus, select Media. Try uploading a pdf, that is what fixed it for me. @zero-24 Can this be closed? The work-around works, because it is negatively ignored as a media type. Since PDFs play an important role in SoHo site creations, e.g. for ideal communities, PDF as a mime type should be allowed per default. My recommendation would be for the Joomla core team to incorporate a fix into the next Joomla release to allow for PDFs. This is more a issue with your server not beeing able to detect the file extension. To me it is the expected behavior that if a extension cant bee detected the upload fails (this is the reason i wrote the code this way) but I'm happy to get another opinions. Technical this is a broken server config and well we can implement workarrounds but they will all compromise Security.. In any case the setting "Check MIME Types" is not taken into account, so at least we should provide a fix for that, right? If the upload is always disallowed if the MIME type can't be determined, then in that case what does the config parameter Restrict Uploads mean? Its tooltip is "Restrict uploads for lower than manager users to just images if Fileinfo or MIME magic isn't installed". I think there's an inconsistency between the tooltip description of this config parameter and the actual coded functionality, and it would be helpful to fix this. @zero-24 I don't see Illegal MIME Types setting being utilized. Do you know why? @zero-24 https://github.com/zero-24 Can this be closed? Then why have Illegal MIME Types setting? Check MIME Types = Use MIME Magic or Fileinfo to try to verify files. Try disabling this if you get invalid mime type errors. According to the above description, this setting can be used to disable the invalid mime type errors, but that is not possible since it is performed after getMimeType. Shouldn't it be something like this? Perhaps it's best to consider what the options should be, and ensure that the code then matches that. The fact that Fileinfo is now an inherent part of PHP has changed things a bit. I've documented below what the options tooltips are, and what I believe the functionality is in the code, as a starting point. Worth checking I've got it right! tooltip: Restrict uploads for lower than manager users to just images if Fileinfo or MIME Magic isn't installed. tooltip: Use MIME Magic or Fileinfo to attempt to verify files. Try disabling this if you get invalid mime type errors. code: Only relevant if Restrict Uploads is set to Yes. If Check MIME Types is Yes then it ensures that the MIME type also is valid (ie in addition to the file extension being valid). This applies for all users, including managers. A valid MIME type is one which is in the list of Legal MIME Types. Even if Check MIME Types is set to No, the system checks that the MIME Type can be determined. 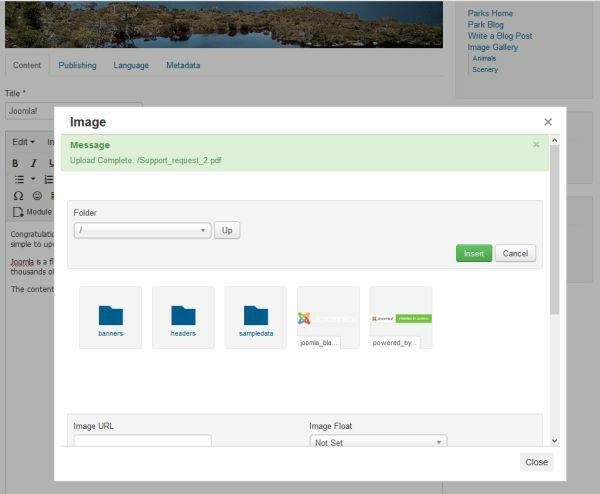 tooltip: Image extensions (file types) you are allowed to upload (comma separated). These are used to check for valid image headers. code: Extensions (file types) you are allowed to upload (comma separated). [These don't have to be image extensions]. tooltip: Ignored file extensions for MIME type checking and restricted uploads. code: File extensions of files which any user will always be allowed to upload. tooltip: A comma separated list of legal MIME types to upload. code: If Restrict Uploads is set to Yes and Check MIME Types is set to yes, then the MIME type is checked against this list, and the upload rejected (for all users, including managers) if the MIME type is not found in the list. tooltip: A comma separated list of illegal MIME types to upload (blacklist). code: used in com_attachments AttachmentsHelper::upload_file to block uploads. In addition there is the question of what should happen if the system can't determine the MIME type. At the moment, this results in an error if Restrict Uploads is set to Yes, regardless of whether Check MIME types option is set to Yes or No. It should include this condition Fileinfo or MIME Magic isn't installed. Please test PR #20156 to show/hide settings relating to restrict uploads. I'm not sure how relevant that condition Fileinfo or MIME Magic isn't installed is any longer. Looking at this page, MIME magic was removed in PHP 5.3, and Fileinfo is now included in standard PHP. So I think that this is one reason why these tooltip descriptions would benefit from being updated. Several people in this thread have mentioned that they are using "mime magic". Can we agree with this and not implement workarounds? Which tooltip to rephrase and to what? Here are some suggestions as a starter. Personally I would change some of the field names as well as the tooltips. I find it confusing having one field called Legal Extensions and another called Legal Image Extensions. I think that showing the latter only if Restrict Uploads is Yes will help to some extent. Legal MIME Types - change to Unrestricted MIME Types. Restrict Uploads – If set to Yes, then users who have not got manager access are restricted to only a subset of the Legal Extensions which can be uploaded. They may only upload a file if its extension is in the specified Unrestricted Extensions or (if Check MIME Types is set to Yes) if its MIME type is in the specified Unrestricted MIME Types. Unrestricted Extensions – If Restrict Uploads is Yes, then this is the list of file extensions which any user may upload. Unrestricted MIME Types – If Restrict Uploads is Yes, then this is the list of MIME Types which any user may upload.